Well, my friends, I guess you can tell by my blog that I've been getting out more! I am driving, and in preparation for going back to work in a few weeks, I've been trying to get out of the house every day. I've been going to Physical Therapy (pool 2 times a week, land once a week), doing some shopping (did you know that not every store has a wheelchair available?) and going to The Merc (you knew I'd get to that, right?). I've also started going to all my yearly Dr. appointments (gyno, cardio, optomo) so that I do them before going back to work. Blah to my Tuesday Dr. who has me coming back in 9 weeks! No fair! 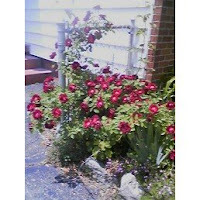 Oh yea, and the rose picture is one I took yesterday with my cell phone. These heirloom roses bloom so beautifully, but only for about 2 days. They deteriorate quickly! Great to hear you're progressing well. Oh and agreed - Blah to the Tuesday Dr. I am not a fan of the follow-up visit. But then, I'm not a fan of Doctors. Yay on your progress! Great to hear you are getting out and about now. I'm sure it's been refreshing.